Workplace wellbeing: a water-based solution? With the deluge of public health campaigns and advice in the media, everybody ought to understand the link between lifestyle and health, but health problems caused by poor diet and lack of exercise are getting worse not better. Look, for example, at the recent release of government figures showing that obesity could cost could cost the NHS in England as much as £6.3bn a year by 2015. Shamefully, I can here reveal that the team that produces Personnel Today is not setting as good an example as you might expect. Our wake-up call came when we had our fitness levels measured by Water Wellpoint, a portable health kiosk which gives you readings of six key health indicators: weight, hydration level, body mass index (BMI), body fat content, blood pressure and heart rate. The kiosk is just one of a range of ways to carry out workplace healthchecks on staff. In April, the government gave its backing for healthchecks when it announced plans to screen over-40-year-olds to tackle lifestyle-related diseases including heart disease, kidney disease and strokes. People will also be offered advice on quitting smoking, diet, alcohol and exercise. The plan has its critics, with concerns that this kind of healthcheck only attracts the ‘worried well’, that a national scheme is not realistic without extra government funding, and that it could put extra pressure on health services. However, given the general concerns about capacity in the NHS, the workplace could be just the place to deliver health promotion, and this is a key part of recommendations made in March by national health tsar, Dame Carol Black. 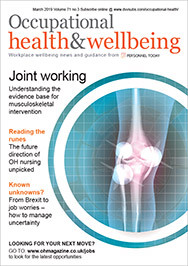 And there is evidence that employers are embracing the idea of health-screening their workforce. Pharmaceutical giant Unilever did a health survey of more than 3,000 of its 8,300 UK staff in 2007, which showed that 21% were at medium to high risk of developing cardiovascular disease within the next 10 years and 52% were overweight or obese. The findings led to a health and wellness strategy. Another approach is Fitbug, backed by health insurer Bupa, which uses a pedometer worn by employees that records steps taken and calories burned. Web technology is used to motivate staff and help them track their progress and there is a Fitlab component that gathers key indicators of an employee’s overall health, including their weight, blood pressure, body fat percentage, resting heart rate and BMI. The Water Wellpoint kiosk, as tested by the Personnel Today team, first appeared in 2007 and, unsurprisingly, puts the emphasis on hydration as Water Wellbeing’s core business is selling watercoolers. The kiosk cannot provide a comprehensive healthcheck, which would usually involve blood cholesterol and respiratory and hearing tests carried out by qualified occupational health practitioners. However, Chris Davies, account manager for Water Wellbeing argues that it has a number of advantages over a full medical. The kiosk captures an individual’s health readings, enabling them to monitor their progress over time as a kiosk is usually sited in convenient location over a long period. And pilot schemes in shopping malls have shown a high level of public interest in using the kiosk. The company can also provide a report across all the staff in an organisation that will flag up any health issues that could affect employee attendance or productivity in the future. Davies acknowledges that the main benefit of the kiosk is that it raises awareness among employees of health issues, and Personnel Today can testify that it’s a talking point around the office. “If we can make a small difference and the employees can take it on board and do something, then we’ve more than done our job,” adds Davies.